Art teacher John Scott and several of his students present the model village on Thursday. 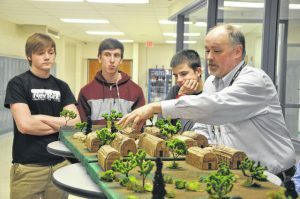 Hayes High School art students in John Scott’s art class have spent the last several months building and detailing a model of a 18th century Native American village that once existed in Delaware. 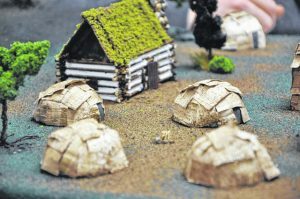 Scott said last fall, Delaware County Historical Society President Emeritus Brent Carson contacted Hayes and asked if one of the art classes would be willing to build a model of Pluggy’s Town, a Native American village that was founded in 1772, roughly where Mingo Park is located today. Carson visited the students and gave them a presentation about the history of Pluggy, a Mingo chieftain, and the village he established on the Olentangy River. Carson gave the students a historical description of the village and what sorts of buildings it had and asked them to design and build a model of the village for an exhibit for the Delaware County Historical Society’s Meeker Homestead Museum. Scott said about 75 of his students have been working on the model between class projects since November, and the students presented Carson with the completed model Thursday. Pictured is a log cabin and several wigwams that are part of the village created by students. “Are you sure you didn’t order this off eBay?” Carson joked when he first saw the model. Students in Scott’s class handmade every tree, longhouse, and wigwam in the village, along with the sole log cabin that historical accounts report belonged to a French gunsmith who lived in the village. The model also includes part of the Olentangy River, which students used resin to give the miniature river the appearance of water. Scott said the model is about 1:87th scale, and students were inspired by Carson’s stories about the village while they worked on it. Scott said he was proud of his students and happy they were able to do the project for Carson. He added the model was built in two parts, and everything is glued down so it’s very easy to transport to schools for presentations. “This is a great collaboration,” Scott said. The exhibit at Meeker Homestead Museum is still under construction now open.